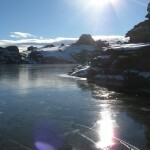 Poolburn offers some of the most spectacular skating in New Zealand. Reports suggest that the reservoir rarely freezes over entirely. 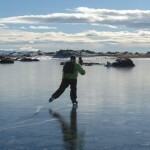 High winds wreak havoc with the ice surface, often blowing away large chunks of ice, leaving a wet watery surface behind. However, when the reservoir does manage to freeze over in it’s entirety, the ice usually remains for extended periods of time and can become very thick. 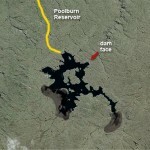 Edward Waite reported that car tyre tracks were present around the entire dam in mid-late July 2010. 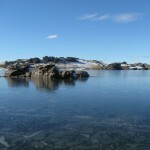 Access to Poolburn reservoir is tricky during the winter months and a 4WD may be necessary. The most direct route to Poolburn is via Omakau, however there are many shortcuts including via Galloway just out of Alexandra. 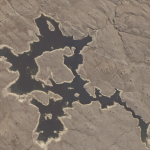 If you have any information, photos or stories relating to Poolburn Reservoir which you think would be suitable for this page, please send it to us, or apply to be an official contributor to the site.